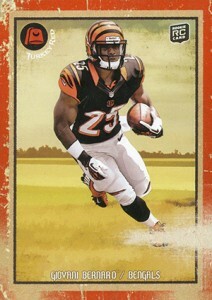 2013 Topps Turkey Red Football is a mix of old and new. While the brand dates back to the early days of the hobby, its spot in the present is as an online exclusive sold initially through the Topps website. The 2013 Topps Turkey Red Football base set has 100 cards. All are rookies. Collectors can also find a pair of parallels. Mini Cards return. Like last year, they're one per box. One-of-one Printing Plates are also randomly inserted. Each base card has four different plates, one for each color of the printing process. Ten players have variation short prints. These cards have a different photo on the front and are limited to 100 copies each. Rookie Autographs are inserted one per box. A total of 70 first-year players have signatures in the set. Of those, 60 also have Green (#/10) and Black (1/1) parallels. 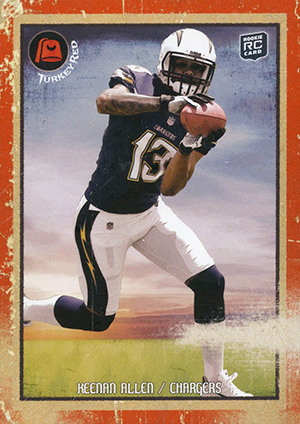 2013 Topps Turkey Red Football boxes go on sale on the Topps website on November 29. ZACH ERTZ 2013 Topps TURKEY RED AUTO RC ROOKIE SP #62 PHILADELPHIA EAGLES RARE! 10 cards. Limited to 100 copies each. Click here to see the variations. Good: Different design over past years. All-rookie checklist. Simple structure. Bad: Shows just how weak the 2013 rookie class is. The Bottom Line: Returning as an online exclusive, 2013 Topps Turkey Red Football is a straightforward release that doesn’t have a lot of gimmicks. Good or bad, it showcases the 2013 rookie class with a retro-feeling look and feel. The exclusive nature adds a little intrigue although without any veterans, it’s easy to be left feeling skunked with a bad break. 2013 Topps Turkey Red Football does a good job of sticking with the overall look of earlier sets while making it distinct. Orange borders will certainly do that. The faux edge wear is an interesting effect considering this is a hobby that’s often obsessed with condition. It’s just a visual. There is no texture to the roughness. With both the mini cards and autographs using the same overall design, there’s not a lot of variety. But it is consistent and I appreciate the simplicity. On the one hand, it’s a whole lot of rookies. In almost every other year, that’d be a good thing. While there are some solid players, we’re still waiting for that breakout. Knowing the quality of the rookies, it’s hard to rag on a set that includes so many of them. 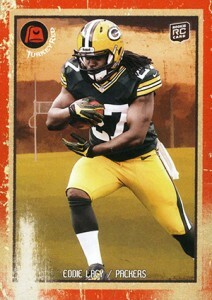 When Turkey Red returned for 2012, it was positioned as a rookie set. To change that up at this point probably wouldn’t be a good thing long-term. So if you know what to expect going in and have reasonable expectations, it shouldn’t be too bad. That said, landing a weak box of an already weak rookie crop does leave a flat feeling. This ties into the rookie class thing again. The chances of a big card are slim and even that’s relative. But getting a decent-sized pack of cards including a guaranteed autograph for $20 is reasonable, particularly if you can land a deal on shipping. Given that the configuration and theme targets set builders, it would have been nice to see a couple of extra base cards per pack. It wouldn’t kill the need to go after multiple packs as you’re still far short of a base set even after five boxes. It might even entice some to go back for more if the set seems attainable. 2013 Topps Turkey Red Football isn’t the kind of set that aims for lots of pop and sizzle. It’s simple, it’s straight forward and it’s exclusive in the sense that shops don’t necessarily have them. To that end, it works. With just 11 total cards per box, it’s not like the traditional experience with most old-school themed releases. But again, it hits where it aims to.